A highly-visible missing tooth can be a major source of embarrassment and keep you from smiling or even talking around your friends, family and coworkers. Many people turn to dental implants to fill in gaps in their smile – but what if you are missing a single tooth from the back of your mouth? Are dental implants still worth it? The answer is a resounding “yes”. Here are a few reasons why you should consider dental implants even if you are only missing one tooth in Friendswood. Bite problems that result from a missing tooth can also place extra pressure on your remaining teeth and prematurely wear down your smile. Over time, your teeth may become extra sensitive or misshapen due to excess wear and tear. Did you know that teeth help stimulate and support the jawbone? It’s true! This means that when a tooth goes missing the jawbone can atrophy, just like an unused muscle will slowly shrink away when you stop going to the gym. With less bone to support the shape and structure of your face, your mouth may begin to appear sunken and aged. Eating a balanced diet is critical to maintaining both your oral health and the overall health of your body. However, missing one or more teeth can make it difficult to eat a healthy variety of foods. For example, if you are missing front teeth you may find it difficult to break off bites of fruits and vegetables like apples and carrots, while a missing molar can make it harder to grind up meat and other tough foods. Instead, you may gravitate toward a diet of soft foods that lack the nutrition your body needs. Dental implants are a proven long-term solution to replacing missing teeth and have the potential to prevent all of the above problems. 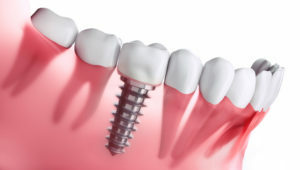 By using a titanium rod placed in the jawbone to mimic the natural tooth root structure, dental implants provide maximum strength and support and can restore the ability to eat, speak and smile with confidence. To learn more about whether dental implants are the right solution for you, talk to a dentist in Friendswood today! Dr. James T. Sierra has over a decade of experience working with patients to improve their smiles and lives through implant dentistry. In fact, he is one of only a few dentists who has achieved the title of Fellow of the International Congress of Oral Implantology. If you are considering replacing a missing tooth, visit the Friendswood Dental Group website or call Dr. Sierra at the office at 281-482-2631.